1. Loathsome, extremely repugnant, reprehensible, shocking, or offensive: Murder is considered to be one of the most abominable crimes committed by anyone. Nathan had the abominable habit of chewing his fingernails in public. 2. Extremely unpleasant or of very bad quality, or very unpleasant to experience: The abominable food that was served in the restaurant tasted terrible and Jim told the manager that he could be sure that he and his wife would never go there again. The abominable weather during the summer was the worst that people had experienced in a long time. 3. A bad omen; nasty and disgusting; vile; loathsome: The flood included abominable sewerage that was flowing into the basements and ground floor rooms of the houses. 4. A statement that describes something that is deplorable, shocking, or awful: That the homeless were forced out of the shelter this winter was an abominable decision. 5. 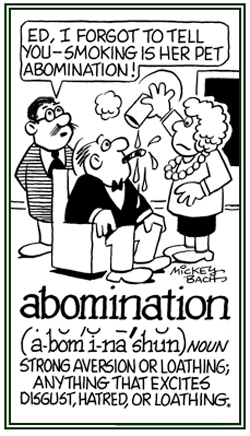 Etymology: derived from Latin abominari, "to detest something as an ill omen". 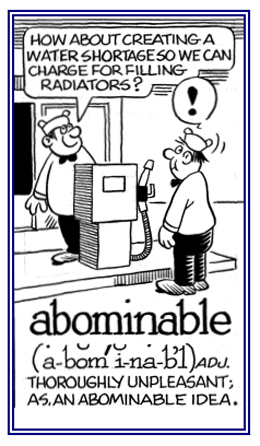 From the 14th until the 17th century, the word was spelled abhominable because people thought it came from the Latin phrase ab homine, meaning "away from man", and so, "inhuman, beastly". 1. To dislike, to find repugnant, and to intensely disapprove of someone or something: Georgia abominates the smell of strong perfume in a small room. Allen has always abominated loud music and could not be tempted to attend a rock concert in the local park. A politician who is revered by his supporters is also often abominated by his opposition. 2. To detest thoroughly; to abhor: There is nothing that abominates Nellie more than the thought of eating raw meat. The crowd will be abominating the imposition of an early curfew by the local authorities. The farmers have been abominating the hot and extremely dry weather. For the ancient Romans, an omen was a sign from the gods or a promise of good or a warning of evil. Naturally, they turned away in fear from an evil omen. 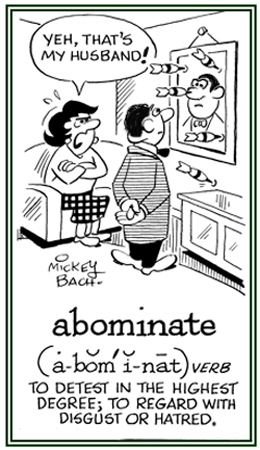 To express this aversion, they combined ab, "away" + omen, "a foreboding, foretelling", into the verb abominari, meaning "to deprecate as ominous", "to abhor"; with a past participle abominatus, the source of English abominate. 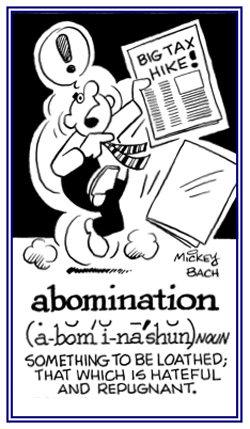 The word has largely lost its original connotation of dread and has come to mean "to loathe, to hate, to despise". Springfield, Massachusetts, U.S.A; 1933; page 5. 1. An action that is vicious or vile; an action that arouses disgust or extreme hatred: The dirty streets of this city are an abomination! Stacey's grandfather still has a strong feeling of abomination for the concentration camps that existed in Germany during the Second World War. 2. Feelings of horror, loathing, or shame: Teressa's feeling of abomination for terrorist killings has never changed. 3. Something that is perceived as disgusting, awful, or ill conceived: Some people see the sculpture in the museum exhibition as art, while others see it as an abomination. © ALL rights are reserved. 1. Someone who intensely hates or loathes: The protest march against the building of a new prison was lead by a well-known abominator. 2. 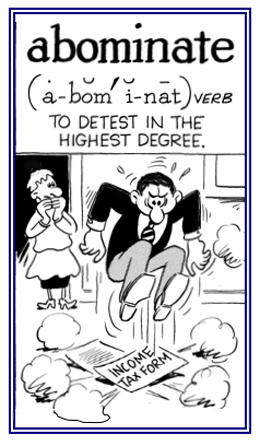 People who thoroughly detest or abhor other people, things, systems, etc. : An experienced team of abominators meet every month to plan protests and rallies against the laws protecting civic inequality. Opposite to, away from, or distantly remote from the mouth: Dale held his fork in an aboral position waiting for the food on it to cool enough to put into his mouth. The native or indigenous people of a geographical area: The New Zealand aboriginals are said to still hunt with spears. Indian tribes in America are considered to be the aboriginals in various parts of the country. 1. Referring to or pertaining to the native people of a geographical area: There are several aboriginal groups in the United States. The Indians are the aboriginal people of America. Some of the aboriginal people of Canada are known as Inuit, "the people". Mike's sister was enrolled in the Aboriginal Studies program at the local university. A descriptive term referring to original inhabitants: The native people were aboriginally located in the central area of the forests. There are anthropologists who say that Native Americans were aboriginally from Asia. 1. Describing or relating to where the earliest known inhabitants lived: The aboriginary location of the native people has been established. 2. A reference to where indigenous or original fauna or flora existed or may continue to survive in a geographical area: The animals in these aboriginary areas no longer exist. The local zoo had an aboriginary section in which the native plants of the region were growing. 1. The original inhabitants of a geographical area: The Roman statesman and orator, Cicero, is believed to be the first person to use the term aborigine as it is known in its present sense. 2. A member of the indigenous or earliest known population of a region; a native: Many Australian aborigines still live primitive lives away from cities. 3. The native flora (plants) and fauna (animals) of a geographic area: A special species of poppy is among the aborigines native to the desert area. Many of the aborigine plants of the region have medicinal properties. 4. 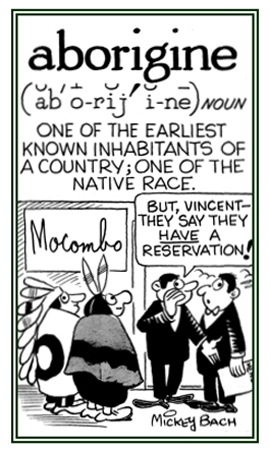 Etymology: ab-, "from" + origine, "beginning, original" coming from the Aborigines, an Italian tribe from Latium whom the Latins were said to be descended; hence, "original inhabitants of a country". © ALL rights are reserved. Showing page 6 out of 13 pages of 191 main-word entries or main-word-entry groups.